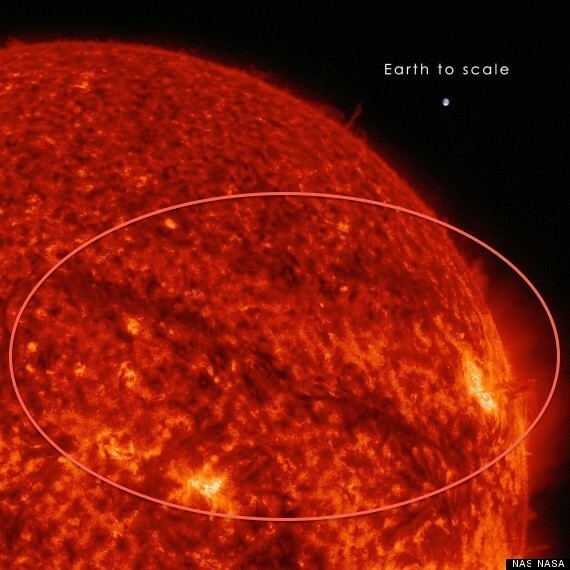 Photosphere: The 100km thick inner layer of the solar surface where light escaping from the Sun's shell radiates. 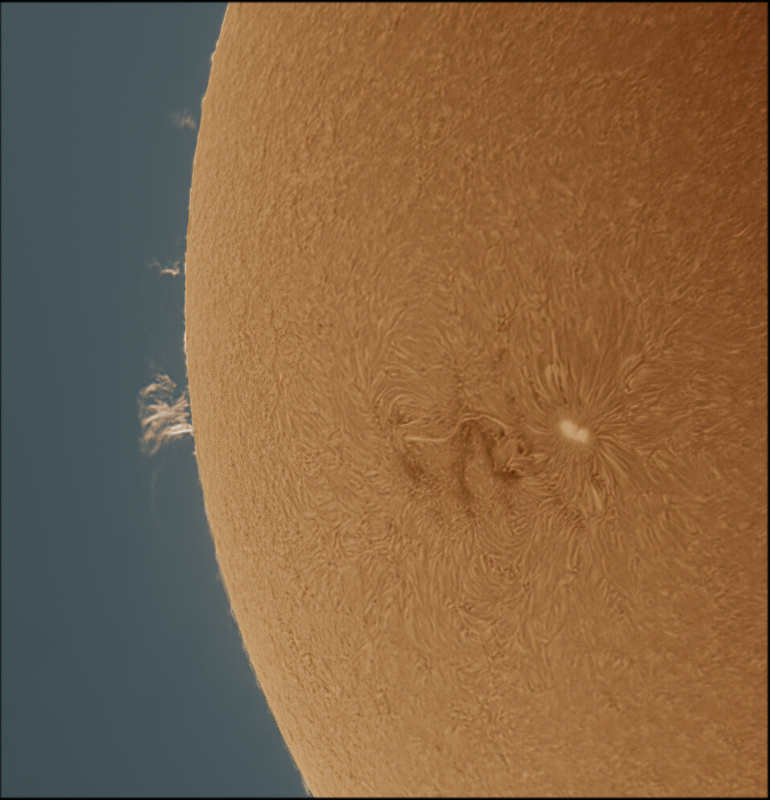 Images of the photosphere reveal features such as sun spots, spicules, filaments, prominences (edge and surface), ribbons, and grannules. 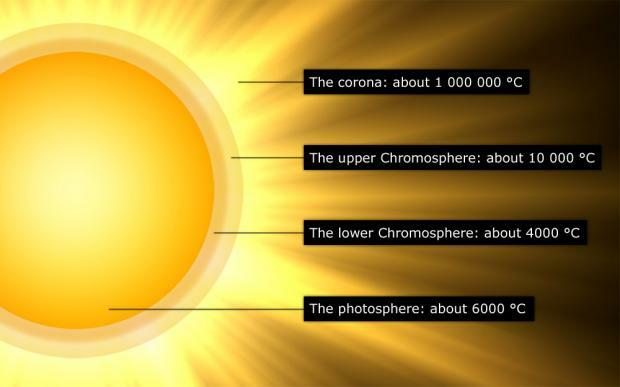 To learn more about the solar photosphere, click here. 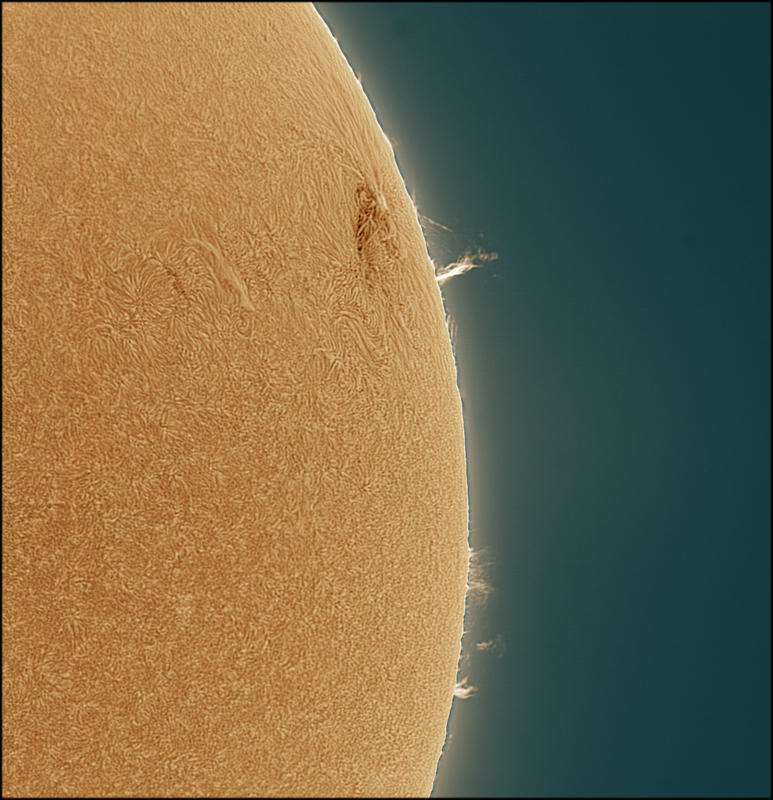 Chromosphere: The second of three main layers of the Sun's atmosphere, roughly 2,000 kilometers deep. 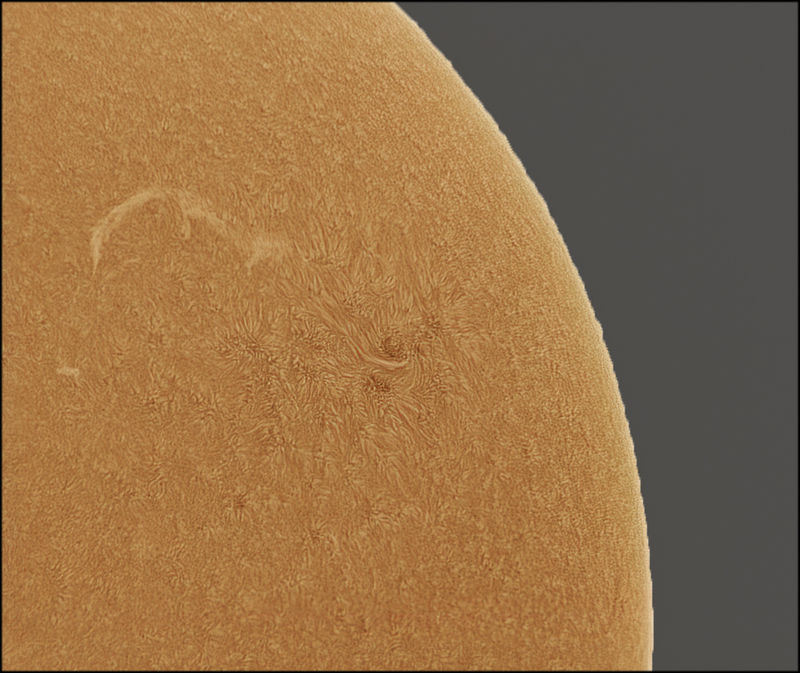 The chromosphere sits just above the photosphere where coronal ejections, prominences and solar flares can be observed. A coronal mass ejection (CME) is an unusually large release of plasma and magnetic fields from the chromosphere. 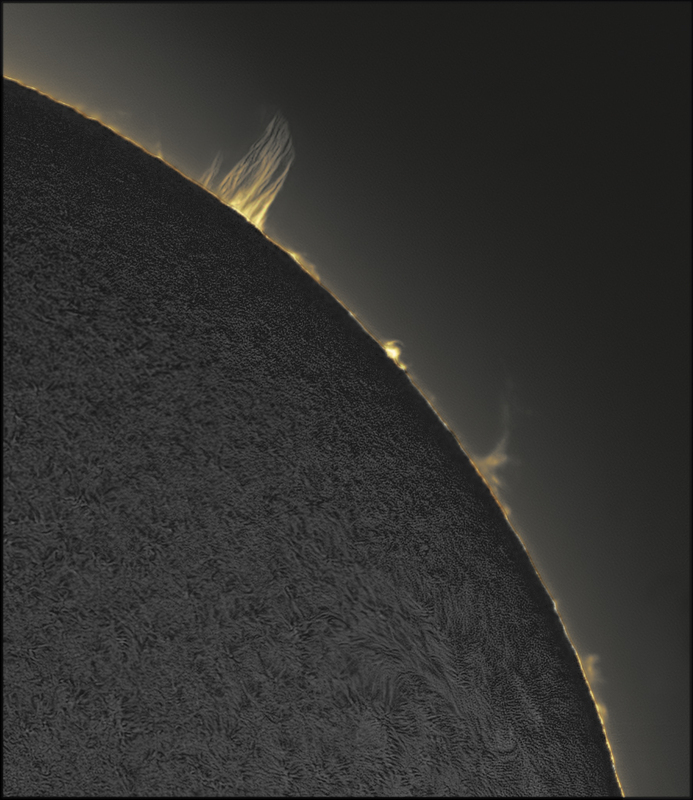 CMEs follow solar flares and and are normally present during a prominence eruption. 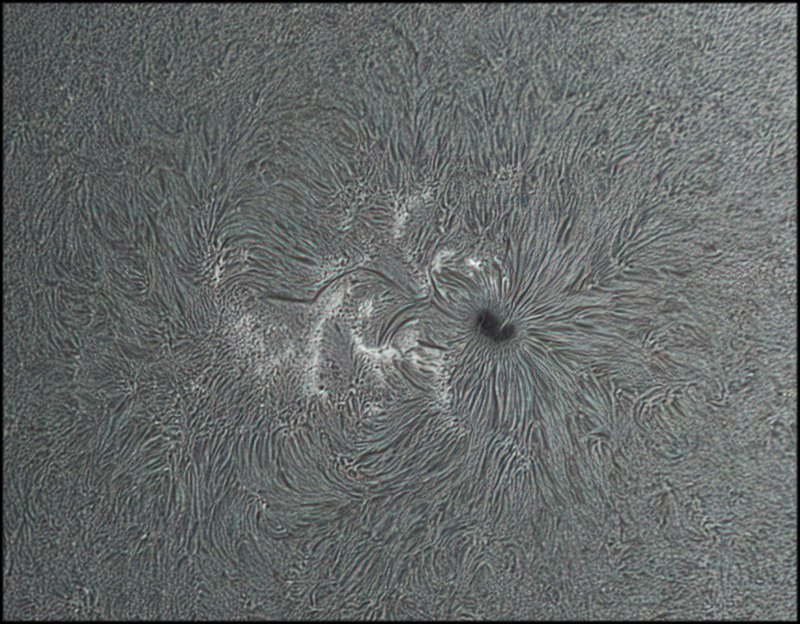 For more Information on the solar chromosphere, click here. 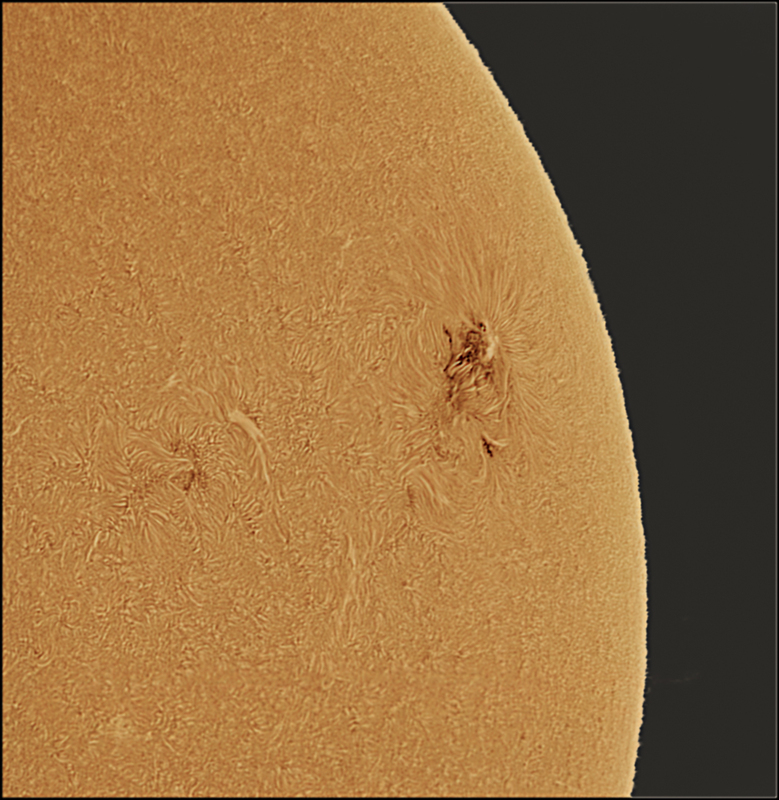 Equipment: Images of the sun's photosphere and chromosphere were captured using a Lunt 100mm solar telescope. These scopes are equipped with a hydrogen-alpha filter passing light with a wavelength centered on 656.28 nm with a 0.7A bandwidth. The telescope is equipped with a DSII double-stack etalon module, narrowing the bandwidth from 0.7A to 0.5A increasing details of the surface (photospheric) features. Harmful emissions are further blocked by an 18mm blocking filter. 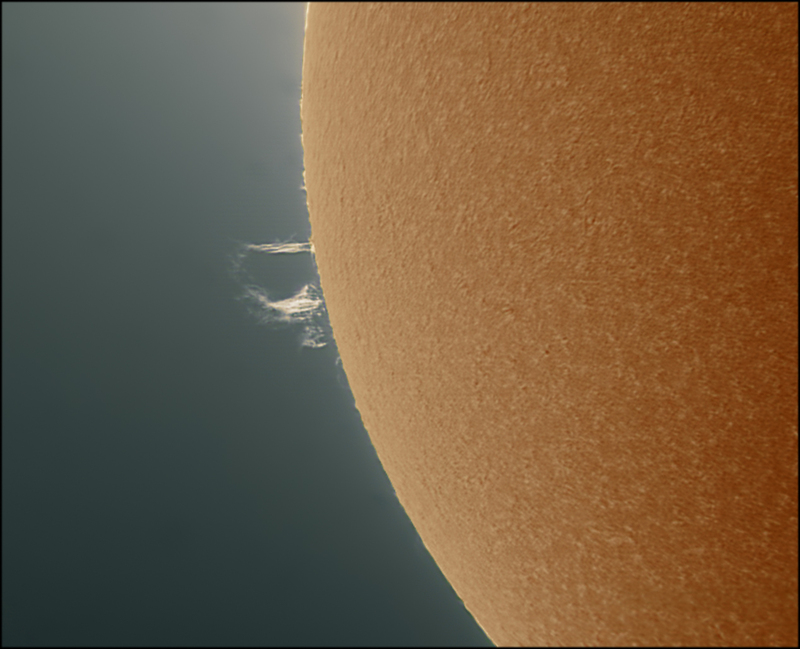 A high resolution video camera is used to record dynamic changes in the layers of the sun's photosphere. The current configuration uses a Point Grey Grasshopper (USB3) instrumented with a 0.83" CMOS chip. 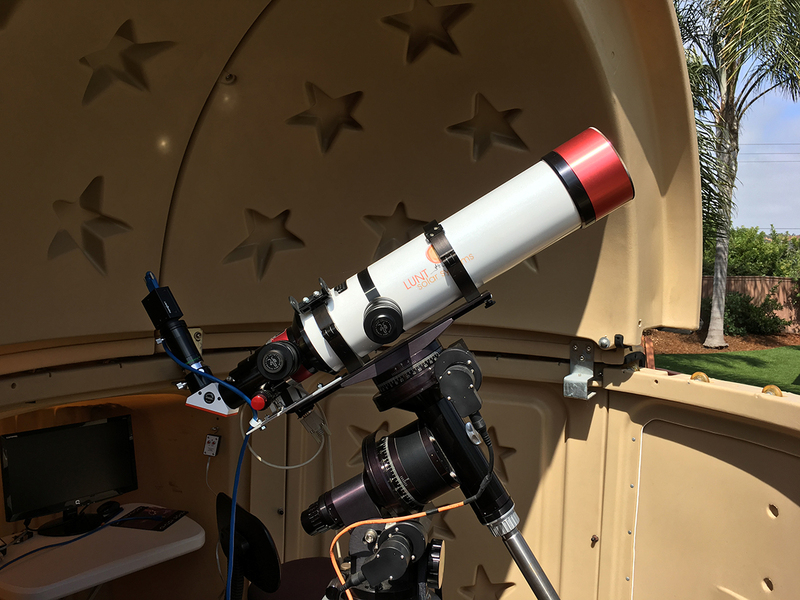 Attaching a Televue Powermate 2.5x barlow between the blocking filter and camera increases resolution even further with an effective focal length of 1785 mm. Solar H-alpha telescopes are equipped with etalons for tuning the centroid of the narrow band of light allowd in. Tuning the etalon (e.g. by pressure tuning or tilting) compensates for the high velocities (i.e. Doppler effect) that characterize fast moving prominences and ejections. Current configuration has two etalon tuners. Data Acquisition: Video images are acquired using frame rates ranging from 42/sec (full frame) to over 150 f/s (for selected regions of interest). Generally, I'll collect 1000 frames per file. A 42 f/s 1000 frame exposure takes 23.8 seconds. 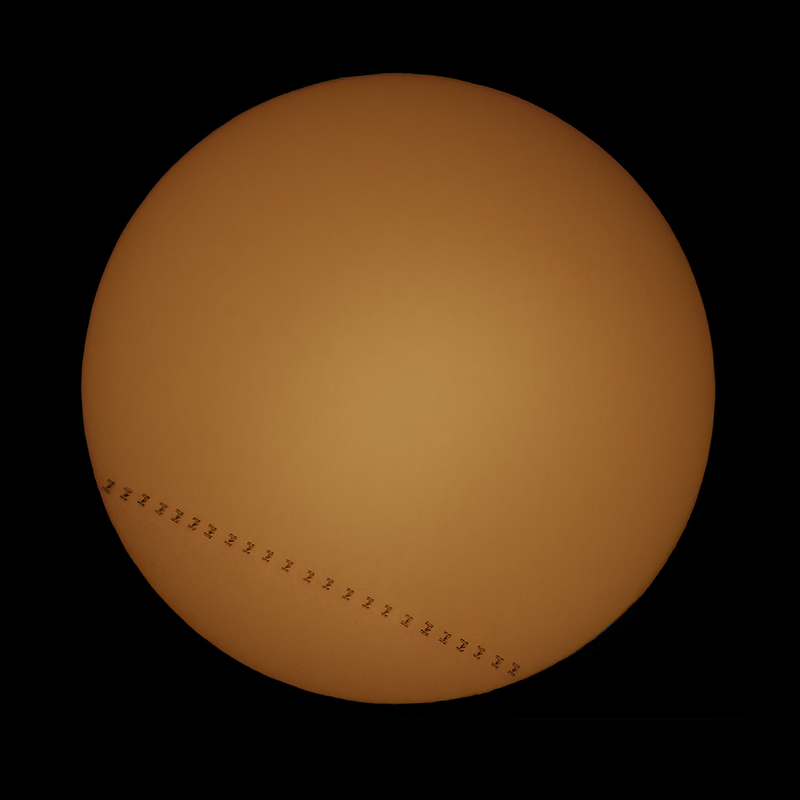 Typical imaging sessions involve collecting 10-15 video files from different regions of the sun over a 1 hr period of time. Conditions and even features can change noticeably over an hour or two, so multiple files are created to capture these changes. Each file is approx 4.5GB in size. Needless to say, file management and image back-up can be a challenge. Currently using FireCapture v2.4 for data acquisition. Procesing Workflow: Video files are automatically analyzed to select the sharpest subset (usually 15-40%) of frames. These frames are then registered using several alignment points and stacked to create a single 16-bit image file. Combining many single frames improves S/N. A single image comprised of a stack of 15% is effectively a 3.57 second cumulative exposure (15% of a 23.8 second video file is 3.57 seconds). Stacking is done using AutoStakkert 2.0. The image then undergoes sharpening and further processing such as inverting, colorizing, more sharpening, and noise reduction. 2 inch Feathertouch Focuser and 18mm blocking filter. Click here for a NASA image from the SDO taken on Sept. 30, 2014 in extreme UV light. The Earth is shown to scale.